Damp proofing specialists in and around Bromley. Are you worried that the timber in your home is decaying? 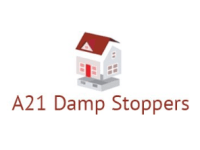 A21 Damp Stoppers can address your concerns. We are specialists at damp proofing services. Our team of expert damp proofers can get your problem fixed promptly and efficiently. You may call us home for a free inspection. At your request, we can do a free survey and provide a no obligation quote. We proceed with our work only after your approval. All our work is guaranteed for a minimum period of 20 years.